Tesla’s issues with delivering new Model 3s to their customers are quite well-known, since Elon Musk himself tweeted about it, and earlier this week Musk clarified the issue, stating that it was based on an “extreme shortage of car carrier trailers.” The weird thing is that if there is such an “extreme shortage,” nobody but Tesla seems to know about it, even the Auto Haulers Association of America. The supposed carrier shortage comes at a precarious time for the automaker approaching the end of the third financial quarter of 2018. As Tesla fervently tries to push out Model 3 deliveries, superfans are volunteering their time at delivery centers to do new vehicle orientations. 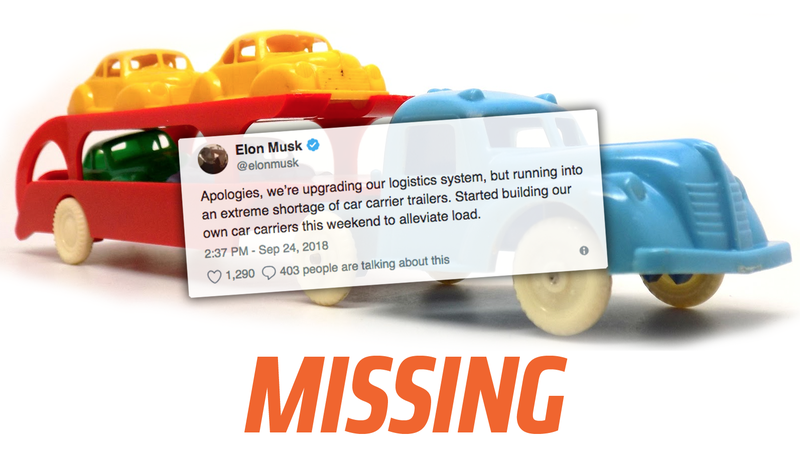 Now, our eagle-eyed readers may notice two interesting things from Elon’s tweet: first, the alleged car carrier trailer shortage, and second that Tesla has “started building our own car carriers” to do the job of the absentee car carriers. Let’s address this “building our own car carriers” thing. What the hell? Even given Tesla’s long-established “we can disrupt everything and do it better our own way” attitude, it is hard to imagine a context where this is a good idea, especially given the manufacturing issues Tesla has been having so far. Plus, if these are being built to fill an immediate and urgent need, would that even work, even if we assume they could build them in time? I mean, whatever “them” is—just the trailer, or is Musk talking about building trucks, too? He can’t be, right? Let’s assume he just means trailers. Well, car-hauling trailers need to have DOT approval. I assumed that would be an involved process, but after speaking with Robert Farrell, Executive Director of the Automobile Carriers Conference, a part of the American Trucking Association, I learned that technically Tesla could build the carriers to established DOT and NHTSA standards and affix a label on the carrier confirming this, without actual DOT testing. So, I suppose if he really wants to, Elon can build his own car carriers. I asked Tesla’s spokespeople about this, but they had nothing to add to Elon’s tweet. They promised they’d let me know if anything came up, though. The thing is, though, there just doesn’t seem to be any actual reason to build your own car carriers, as there does not appear to be any shortage. Farrell did clarify that there could be an issue with the particular carrier Tesla has contracted with, but he also went on to say that there was absolutely nothing stopping Tesla from picking up the phone and making arrangements with an additional carrier to transport the cars. Farrell believed doing so was entirely possible, as he did not feel there was any scarcity of car carriers. Farrell did acknowledge one transport-related scarcity issue: two-tier railcars. Railcars are used to transport cars all over the country, and come in two types: bi-level and tri-level. The bi-level ones are used for taller SUVs, and the tri-level ones for sedans and smaller cars. Because of the boom of SUV sales, the bi-level ones are in short supply. This, however, would not affect the Model 3 deliveries, since the Model 3 is a sedan. And, Musk’s stated issue was with trucks, not trains. To be sure there isn’t some sort of hidden car hauler crisis, I reached out to another person who’d know: Guy Young, General Manager of the Auto Haulers Association of America. I asked him if there were any known shortages of auto haulers in America right now, and especially around California, where the Tesla factory is. “No. Not to my knowledge,” he said. He also told me that not only were there no known reports of a shortage of car carriers, it’s significant to note that other manufacturers have not reported any similar issues, and are hauling thousands of cars all over the country every day. Young did have a possible explanation about what may be going on with Tesla. Essentially, Young suggested that the issues may not be about an actual shortage of auto haulers, but a lack of planning on Tesla’s part. It’s possible, Young speculated, that Tesla had not taken the time to establish their relationships with auto haulers early enough, and are now finding themselves in a position where they’re unable to get car carriers to meet their desired timetables. So, in that context, Elon may be correct, in a way. There could be a shortage of auto haulers, but only in the sense of a shortage of auto haulers that Tesla has taken the time to plan with and establish a working relationship with. If Tesla had not planned this out sufficiently ahead of time, this perceived scarcity could be the result of that. This is speculative, of course, and while we did reach out to Tesla to find out more about their auto hauler situation, we have yet to receive a response. If it helps, Elon, I found this link with a lot of car haulers for sale, right in California! You don’t have to build your own—these are already DOT approved, and some are as cheap as $25,000! It’s a steal! I’m sure the seller knows what he have, but still, I bet you can make a deal.